Perhaps the biggest limitation with HRV monitoring in a team setting is obtaining and maintaining compliance from athletes. Daily HRV measurements can become monotonous, particularly for athletes who may not fully understand the value of the data. One question I’ve had in mind for a while now is; what is the minimal frequency of HRV measurements we can acquire that can still offer meaningful information regarding training status in athletes? If you’ve read any of the research on HRV and athletes, you’d note that HRV is rarely measured daily. This is likely because having each subject report to the lab everyday to have their HRV measured on an ECG is impractical. However, with the advent of valid and reliable devices such as the Polar RS800, R-R intervals can be collected in the field making more frequent measurements a little more practical in the research setting. However, for the practitioner in the field, an even more practical, economical and user friendly device is desired. Thankfully smart phone app’s such as ithlete were created to accommodate this. So now we have very affordable, very user friendly smart phone applications that can provide us with HRV data. The trick is getting the athletes to use them often enough so that we can use the data for monitoring purposes. Is it more of a reasonable expectation of our athletes to collect only one or two HRV measurements per week as opposed to every day? Will this provide us with enough information to draw meaningful interpretations from? After giving it some thought, I decided to review some data over a 3 month period. 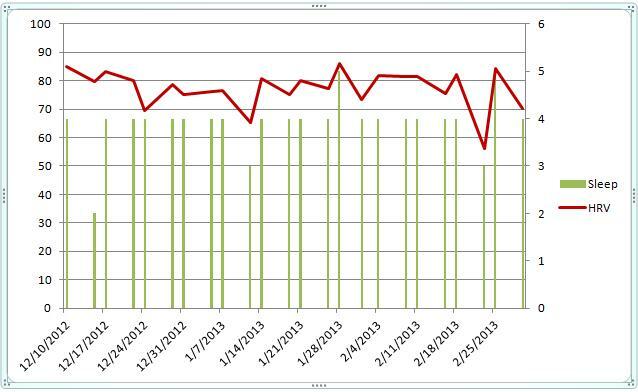 With my own HRV data, I recreated trends in excel with; once per week, twice per week and daily measurements. The purpose of this is to see what these varying frequencies of measurement reveal in the trend. I’ve also included sleep score data which is graded 1-5 based on perceived quality and quantity after waking. – There is a period of time between the 4th week of December to the 2nd week of January that my HRV trend declines and I rarely see scores over 80. During this time (the Christmas Holidays)I was not lifting regularly and experienced some detraining. – Daily measurements allow for sRPE to be recorded providing the coach with a good indication of how the athlete is perceiving and responding to the workouts. Conversely, the sRPE allows the coach to see when the athlete is experiencing high stress in the absence of a high load training day. – Daily measurements allow the coach to see acute changes in HRV which can be important in planning or manipulating training. – It’s worth mentioning that my highest levels of strength were displayed over the last week of February and early March (early March not included). This is expected as I am nearing the end of my training cycle which has transitioned from moderate intensity/high volume to high intensity/low volume. Coincidentally, my HRV is reaching peak heights. I’m not entirely sure what to attribute these high scores to as I have been doing less aerobic work than normal. This may or may not have any meaning. Some vid’s are posted below from this “realization” phase. – I chose Monday as the reference day because it is the day of the week furthest from training stress that can influence HRV. My goal was to find a day that gives me the best indication of baseline HRV. Since I train Mon-Fri and rest on weekends this left Sunday or Monday as the best options. I selected Monday over Sunday because Saturday nights can be social, late, etc. and therefore affect Sunday morning results. 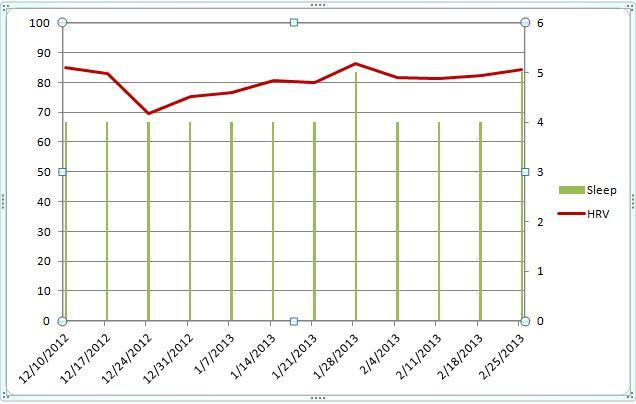 – This trend clearly shows my detraining period over the holidays. – Coaches should be cautious when using weekly measurements due to potentially low scores caused by non training related stressors that may obscure interpretation. For example, if an athlete has a rough sleep Sunday night, HRV may be lower than usual Monday morning. This does not mean the athlete is fatigued or should have training loads reduced. Therefore, coaches need to keep tabs on performance and feedback from the comments section. Clearly, weekly measurements have its limitations however it still may offer some value. – I chose Monday and Saturday as my reference days because Monday represents HRV at rest while Saturday represents HRV after fatigue has been accumulated all week from training. 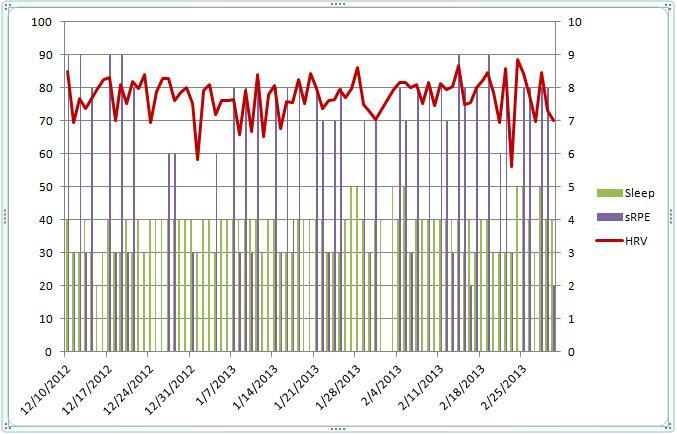 This may provide some insight as to how stressful the training was based on Mon-Fri change in HRV. I am a bad example for this as I try and allow for HRV to reach baseline at least once during the week using Wednesday as an active recovery day. Data from an athlete involved in training, practices, class, etc. would have a different trend. – This trend allows for comparison of Sleep quality pre and post microcycle. In my trend, Mondays sleep scores never fall below 4 while there are 2’s and a 3 from Friday night’s sleep. – As with the weekly measurement, this trend fails to capture major acute changes (highs and low’s). Weekly measurements performed after a day or two of rest to allow for a true measure of baseline HRV can be useful in determining how an individual is coping with training on a week to week basis. However, I would urge you to be very cautious when interpreting trends as a low score caused by poor sleep or something other than training fatigue can provide a false sense of training response. This is where subjective measures, performance indications and regular communication is important. Twice per week measurements might be the frequency which provides us with the most meaningful information from the least amount of data and therefore demand from the athlete. Seeing how HRV changes from pre to post training over a one week period likely provides much more meaningful information about training status verses weekly measures. It goes without saying that this needs to be manipulated according to the team’s training/practice/competition schedule. I used myself as the example today but most teams will not have Saturday and Sunday completely off from training. Perhaps starting with weekly or twice weekly measurements is sufficient for getting athletes started and comfortable with the device. The goal should be to eventually get them to take daily measurements as this will provide more complete information including sRPE, daily sleep score and comments. The comments section is highly underrated and I intend to elaborate more on it’s value in a future post. This entry was posted in Heart Rate Variability, Training Log and tagged athletes, heart rate variability, HRV, iThlete, monitoring. Bookmark the permalink. 4 Responses to Making HRV More Practical For Athletes: Measurement Frequency?